Great looking shoe, get compliments. Comfortable. Super light. I’m hooked, and can’t wait to buy more in different colors. Sweeter than paying off your mortgage. I'm a middle aged white guy with mediocre fashion sense ... At best. 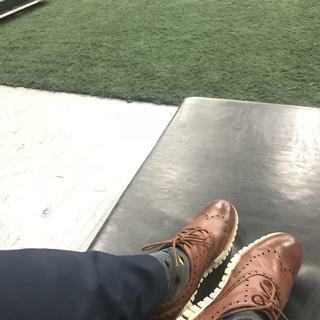 My shoes are normally bland, typical of what an uninspired middle school principal would wear, and generally as comfortable after a few hours as one would expect wooden blocks to be. So I bought these and I'm suddenly cool. I was recently invited to happy hour at our friends house. Now these friends are a GCWoK couple and have a much better idea if what is cool than I do. Both of them loved my shoes. So aesthetically, they are in the win category. As for comfort, I've never had anything like them. It is seriously like wearing a custom pair of running shoes. Actually, had he had access to these shoes, Forrest Gump would have likely chosen to wear these when he ran across the country. The most comfortable shoes ever got 9 pairs. Great to wear at home and abroad. This model last worn walking all over Paris which I know like the palm of my hand. Feel like wearing gloves on your feet. And on top of it all they look brand new. Hands down most comfortable shoes ever where I can be professional and casual in style. My husband loves these! He said that they are super comfortable. He also gets a lot of compliments. My second pair of colehaans in 3 months. Another great pair to my collection. Leather is soft and a little pliable. Shoe is so light and the free like flex grooves give you that flex ability for a natural stride. Good job, Colehaan! Shoe fit perfectly and feels great! I love these shoes, they look great and are super comfortable! I plan to buy a couple more to add to my wardrobe. Great shoe. Sometimes my Cole Haan purchases are hit or miss. At first, I purchased the standard width, which I had to return. I went with a wide fit and I'm pleased that I did. Great shoe. Super comfy, and they look great. My favorite purchase. I have multiple pair in different colors. This is my go to work shoe. Time to replace them. Its not true to size even if i use the size chart on the website. The Best Gift You Can Give To Your Feet! This one was my third pair purchased of these almost perfect Cole Haan hybrid sneaker-shoes in so many months...am I glad I rolled the dice on them! Anyone who works on their feet should own at least one pair of these trainers masquerading as shoes (preferably more than one). This particular shoe I must admit is only "almost perfect" because of its modern, narrow toe box (I suppose it is after all a modern shoe with some borrowed aspects of classic styling). The modern last elongated the shoe just a bit as it could have seemed a more classic-looking hybrid with a slightly rounded toe box from a different last (and perhaps even added to its country walking shoe comfort). Just received the tan/white. Pair #. . . .well stopped counting. The most comfortable shoes ever. Light as a feather yet well constructed for jeans or dress casual wear. Do not miss out. . . .get a pair. It is a great shoe for the office or social outings. It is nice enough to dress up, or you can dress it down for less formal affairs. Also, it is super comfortable. I am on my feet almost all day at the office, and my feet are barely sore after walking around in these for 10+ hrs. Very stylish and diverse shoe!! Most comfortable shoe in my closet! My 5th pair of GRANDS, and right out of the box feel great! Got asked just the other day “What kind of shoes are those? That sole is really cool”. This is a day in the life of any ZER0GRAND owner! I have these in 3 other colors - these ones are my most recent purchase and they are great. Light weight, comfortable and look great. My everyday shoe and I couldn’t be happier. This is my 4th pair of the exact style. I may have to try out the Zerogrand 2.0 next! Love these shoes. The fit is just right and they look terrific on any occasion. Best shoes! Comfy, dressy, casual with little break in period. Love these shoes. This is my second pair of these shoes, I still wear both to this day. The break in period is very small and they are so comfy at work. You can dress them up or down depending on the occasion. I haven’t tried the zerogrand 2.0’s yet but it may happen if there is another big saw. I just recommended them to my dad and he also bought two pairs. Perfect fit. Extremely comfortable. LoOk casual but can be worn for more formal events just the same. The polish wears off very fast. I have several pairs and they all do the same. You should send me another replacement pair. These are my go-to shoes for travel, trade-shows, or a day at the museum. I get tons of compliments and love 'em! The most comfortable shoes on earth style color dressy casual and if you need to run then run!! Shoe makers that know what they are doing are a dying breed. these days unless you spend an obscene amount of money (and even a lot spent doesn't mean satisfaction) on a pair of shoes you don't really get quality items too often. IF Really good looking shoes are made from lower quality materials what happens is that while the shoe looks appealing if the wrong leather and craft is used the overall experience suffers. I am proud to state that the leather and craft used to build these shoes is very well designed balance for the price point. I wish that all shoes had more arch support these days but I again am proud to say that the design on these shoes allows enough space for optional heel and arch supports without sacrificing comfort. The leather used is very soft and the overall design of the shoe is spacey while the facade of the shoe is narrow.and stylish. there is definitely nothing grandpa about these shoes.. Most comfortable shoes I've ever worn, great for work and excellent for any other casual activities. Another great purchase! This is my 6 pair from this style. Light weight & very comfortable. Wear 10.5 in everything these were cut slightly larger. Husband's birthday, good quality, unique style, large size available. im a cole haan lover. i was in Cole Haan shop this morning and got surprised from the unfair price! i chose the one i liked with perfect size, then i bought it from the web with much lower price. The look and for the known comfort. It looks very good and can be paired with anything! Once you try them you will never go back to regular shoes. Price with the sale and heard how comfortable they are along with the style. These are GREAT versatile shoes... can be dressed up for work, or down with jeans. My husband swears by them and has them in many colors! I own the same item in Black - best shoe I have ever purchased! Comfortable yet professional appearance. This is my 8th pair of Cole Haan Zerogrands. Since I am on my feet a lot at work these work perfectly. They look great and they are extremely comfortable. Not only is this shoe incredibly stylish, it is also the most comfortable show that I have EVER owned. Comfort and style. I have 4 other pairs in various colors of this shoe and love the fit, feel, and look of this shoe. When do the wide width's restock? Do you have lighter tan? Can these be worn with a suit? Or are these strictly casual Oxfords? Thank you. I feel like they give a well fitted suit a more modern look. Can't be wearing a suit the same way all the 50+ year olds in my office do. I wear them more casually but my work is more formal so I don't wear them with a suit. They could be worn with a suit if it's a more fashionable event. I bought size 10, both suede and waterproof leather, and they are a bit tide. Should I exchange for 10.5 or they will strech? BEST ANSWER: I wear a size 10, as well, as the softness of the shoe has done a really good job in stretching. Personally like a sleek look & the fit works for me. I found them to break in nicely and mine are great. Though I do not have the waterproof leather version. Do these shoes have holes that go through or are they all blocked off? BEST ANSWER: The holes are purely decorative, none go through the shoe. Yes. The holes are blocked off. Can the sole color be changed ? BEST ANSWER: Nope, why change perfection. The white is what makes the shoe POP, every time I wear them I get "that sole is awesome". 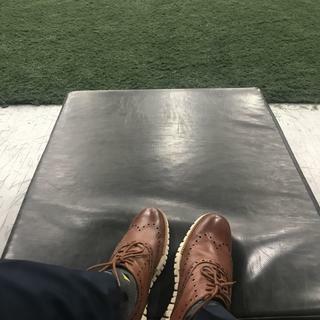 Can these (zerogrand wingtip oxford in woodbury) be polished? BEST ANSWER: Sure! For colors other than black, neutral is a good choice to restore luster and moisture to the leather. To cover scuffs and scratches, we recommend a light application of a complimentary color polish. Be sure to test it in an inconspicuous area before applying to the entire shoe. For unusual colors or shades, check with a local shoe repair shop or men's shoe retailer. You may also visit www.myshoehospital.com and click on Shoe Care to see their assortment of polish colors. Definitely, I’ve had this pair for years and I’ve had them professionally polished multiple times! BEST ANSWER: We do ship from both of our warehouses and also from retail stores. We cannot guarantee that you will receive a shoe that has not been previously tried on. Are the laces real or is it an actual slip on? BEST ANSWER: The laces are real and this is not a slip on shoe. This color is one of my favorites. I have this shoe in several colors and wear the British Tan more often than any. Great for everyday at the office and jeans also. I can dress down and put my ZG’s on and be stylish. Mine are beginning to look worn in after two years so time to replace them. The laces are real. It’s a nice quality lace. I have had these shoes for over two years and have not had to replace the laces. Love these shoes. Yes, laces are real. Love these shoes, always get complements when I wear them. Real laces. This is an Oxford shoe. These come with a real lace. Can you wear them in winter and rains ? 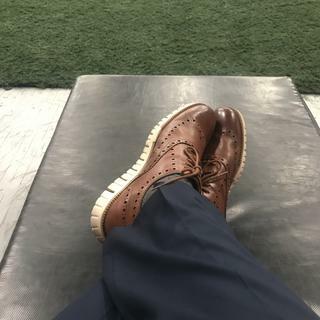 BEST ANSWER: ZeroGrand Wing Oxford are my all time favorite shoes with great comfort and an eye catcher ! I honestly receive a lot of compliments from both men and women who state "that is a great looking pair of shoes" Yes, the shoes can be worn in the winter and when it rains. The classic wing tips looks great in all seasons. I HIGHLY RECOMMEND ! I only wear during the spring and summer in all weather. I have the same pair all black and a dark brown that I wear in the fall and winter. They do well in the rain. Wear mine all season long. Of course I'm not trying to cross any streams or large ponds. Yes. They clean up well after both. Just make sure to use the rain guard spray. I wear these shoes year round in all kinds of weather. They clean up nicely. Will this be a good type shoe for that? BEST ANSWER: Yep. The only problem with these is that you’ll probably buy more and more pairs and won’t want to wear anything else to work...like me. If you are comfortable standing that long in athletic (running) shoes, you will be comfortable in this one. Great shoe! Yes! These are more comfortable than running shoes. What is the lifespan of these shoes for regular wear? BEST ANSWER: Years. My husband works in retail and is on his feet all day. He still wears his first pair from 5-6 years ago. Best shoe investment. I have had this shoe for a couple of years now and they look as good as the day I got them. I have about 6 different pairs of the Zerogrands and they are one of the best shoes I have every owned. I've had my pair for roughly 2 years now and they still look and feel great. I wear them 3-4 times a week at work and sometimes on the weekend. 4 to 5 years looking good; after that another 2 to 3 looking down-at-the-mouth-millennial good... using an old school metaphor. which polish would you recommend I use for this color? BEST ANSWER: I like to stick with a clear polish or leather lotion. Polish tends to build up in the holes and ruin the look. Cole Haan sells polish on the site as well specifically designed for their shoes. I Took mine to a colehaan store and they polished them and sold me the polish i think for about 8 bucks or something along that line. What if you buy one size up and they are a bit bigger? Will they stretch even more and be even larger? BEST ANSWER: I have worn mine<10 times, they stretched very little and not as leather typically stretches. I have two other colors of the same shoe and the same allies to them also. Never purchase a shoe too big. Once you begin to wear the shoe it is only going to stretch & potentially curl up at the front. My British Tans Came in darker than expected, will they lighten up with wear or can I do something to lighten them up to look more like the color on the site? BEST ANSWER: Mine came accurate to the color on the site. Typically with leather as it ages it darkens, so just roll with it and luv the style and comfort! Does the "metallic" or shiny finish get scuffed up after a few weeks of wear? If so, were you able to shine them like a normal dress shoe? BEST ANSWER: Yes, it can possibly get scuffed. Yes, you can polish like a normal shoe. I suggest Cole Haan leather spray protector. It can help with keeping that metallic or shiny finish. My Zero Grand Wing Oxford looks like the day I bought it. After each wearing, I simply wipe the shoe with a damp cotton cloth. Thanks, Mike. Besides the obvious difference in soles, how are the Grand Evolutions and Zero Grand wingtips different? I am looking at British Tan in both. Also it appears that the tan vs tan/java is a different color. One looks like more of a "Cognac". BEST ANSWER: On the exterior, the ZeroGrand's pinking and perforations are more pronounced. The GrandEvolution is a bit more subtle in its leather designs. On the interior, the fit and feel is slightly different; while both styles have Grand.OS foot bed technology, the GrandEvolution has an anatomically molded interior sock liner which provides a different feel. Both styles are very lightweight and flexible. The ZeroGrand has a storm welt (added layer of leather between the sole and the uppers). Either one is a great choice, but you really should try both on for a valid comparison. Check product details on the page for more info. 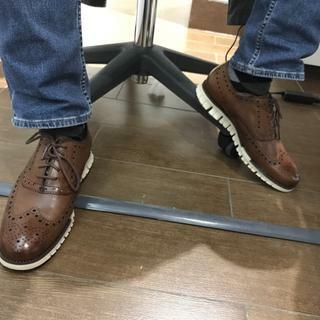 Zero Grand wingtip dressy and casual ! !where Grandevalution are more dressy!! Whats the difference of a 9.5M and a 9.5W zerogrand? BEST ANSWER: For Men's shoes, D = Medium Width; E = Wide; EE = Extra Wide. For Women's shoes, A or N = Narrow, B = Medium and C = Wide. The difference in each width is approximately 1/4". The best way to find your accurate size is to visit a shoe store or shoe department and have your foot measured on the Brannock device. BEST ANSWER: This style is made in China. Please visit our FAQ section to learn more about, "Where does Cole Haan manufacture its products?" Best way to fix scuff marks on zero grand wingtip shoes? BEST ANSWER: If the scuff mark is not too deep, first try rubbing your finger back and forth repeatedly over the scuff mark which will generate heat and bring the oils in the leather to the surface. This will oftentimes lighten the look of the scuff mark. Regular application of a complimentary color cream polish will do a good job of hiding scuff marks while adding conditioning and shine to the leather. For deep marks or cuts in the leather, take a trip to the shoe repair shop. do these come in 3E? BEST ANSWER: This ZeroGrand Wingtip oxford is available in Medium (D) and W (E) widths only. Will you be getting any more of these in wide widths? BEST ANSWER: You can expect to see this style become available in Wide widths later in the Summer and into the Fall at many of our retail partner department stores and major online retailers. My husband loves these shoes, but needs a 9 wide in the British tan color. Do you anticipate getting more in stock??? BEST ANSWER: For an idea of which Cole Haan ZeroGrands are available in 9W, shop by size and width using the drop-down menu on the men's shoe page.